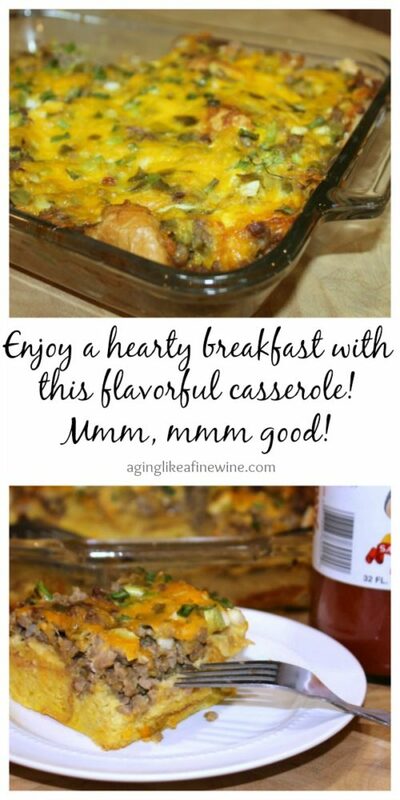 This simple little breakfast casserole has been a hit with everyone I’ve shared it with. I’ve often been asked for the recipe, so I thought I would share it with you in the hope that you’ll feel the same way! Anytime we have company staying with us or with any family vacation, this casserole is a must. It’s fantastic because you make it the night before and let it sit in the fridge overnight. In the morning you just pop it in the oven at 350 degrees and in about 45 minutes you have a delicious, hot casserole. Read more…. Whether They’re Called “Dots” or “Winks” These Cherry Cookies are Delicious! Do you ever receive recipes from friends or co-workers and even though you have every intention of making them, it just seems that you never actually get it done? It’s happened to me many times. Recently as I was looking through my recipe binder I came across one of those recipes for cherry cookies. The recipe was called Cherry Winks and I decided to give it a try. Anything with cherries, especially maraschino cherries can’t turn out bad, right? Read more…. Wonderfully good and incredibly easy dessert recipe; make Cherry Delight tonight! This easy dessert recipe is so quick to make, yet it tastes so good! You’ll find yourself reaching for the ingredients again and again. 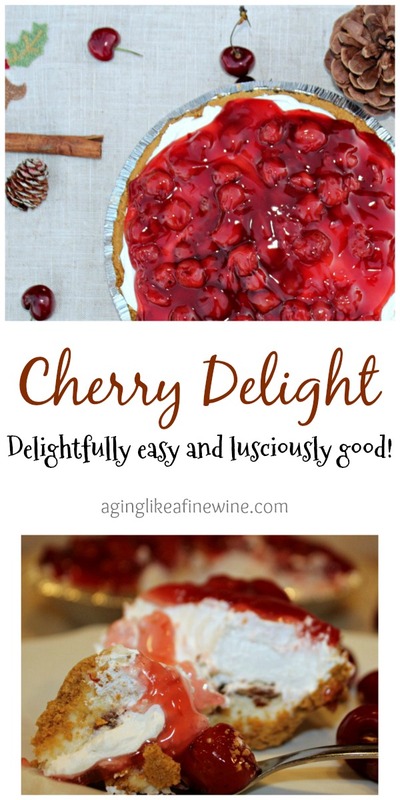 And with all of those beautiful red cherries, I think Cherry Delight is the perfect festive holiday dessert! The holidays have snuck up on me this year. Until a few days ago, I hadn’t even given a menu a second thought. In past years, I’ve tried too hard to make a big dinner, turned down help when offered and ended up stressed out in the kitchen. I’ve decided I’m not doing that this year. We’re Having Fun in the Kitchen Testing a 5 Star Lasagna Recipe! 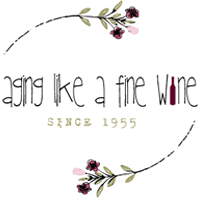 Stories of “Mom and Luke” cooking together in the kitchen! Episode 1 – Testing the World’s Best Lasagna recipe. My son is a pretty good cook. Grilling is his favorite thing to do, but he knows his way around the kitchen too. For a few weeks he had been telling me about a lasagna recipe he saw on AllRecipes.com. 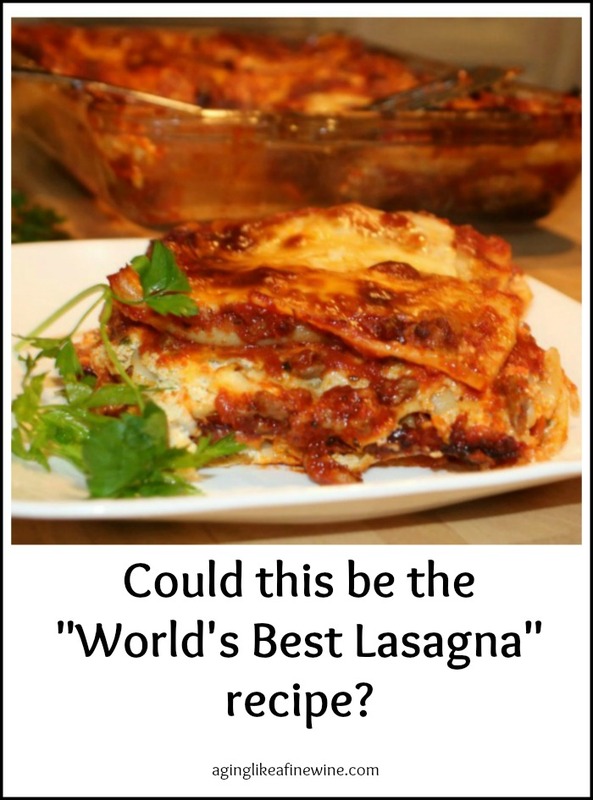 He said it was called “World’s Best Lasagna”, had over 10,000 reviews and remained a 5 star recipe… and that we should try making it together. So I took the bait and the lasagna cooking day was planned. Read more…. Pumpkin Oatmeal Cookies and the soon to arrive Autumn… perfect combination! Autumn is my favorite time of year, my only wish is that it could last longer! I love the crispness in the air, the beautiful leaves, fall festivals and the smells of cinnamon, nutmeg and pumpkin baking. I’m ringing it in a little early this year because I’m so anxious to share this delicious recipe for pumpkin oatmeal cookies with you. It has all of the right autumn ingredients that bring lovely scents to your home and cause mouths to water! Read more…. Warm chicken salad….mouthwatering goodness you’ll love! I’m going to once again throw those fears to the wind and just share it with you anyway! It’s a recipe for chicken salad that you Read more…. Picking fresh raspberries today for homemade cobbler tomorrow! Raspberries were never one of my favorite fruits because of those little seeds, but when I read that July 19th was Raspberry cake day I decided to use them not in a cake, but a cobbler. And I wanted to pick fresh ones. So my husband Paul, our collie Gunnar, and I went raspberry picking. I had a ball tramping along through the woods, picking berries as I went. If you haven’t picked raspberries before you might not know that the bushes they grow on are covered with thorns, so it takes a little strategy to get them to give up their berries! Read more…. Summer is upon us with it’s rich variety of delicious fruits and vegetables. 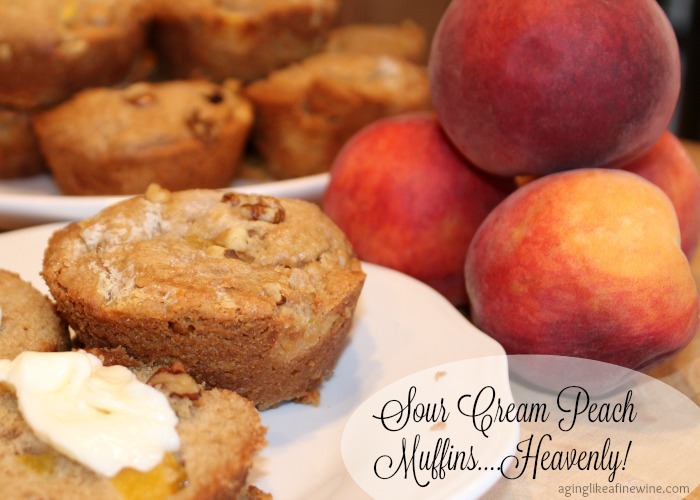 Of all the summer fruits sweet, juicy peaches have always been one of my favorites. And because they’re one of my favorites, I have had such a graving for some. So even though the selection of peaches was not what I would refer to as inviting, I couldn’t help myself and bought some on my last trip to the grocery store. Impatience didn’t pay off (once again) and the peaches were just okay, lacking that sweet juiciness I love. Read more…. 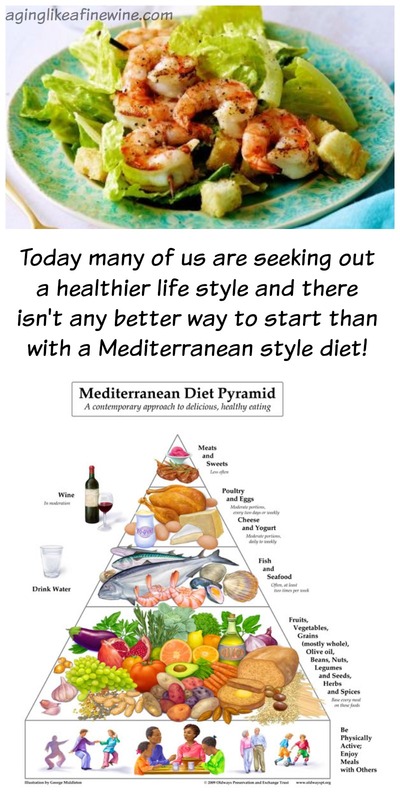 Mediterranean Diet basics plus a recipe to get you started! For years now we have all heard the merits of the Mediterranean Diet lauded from television shows, magazines or newspaper articles. So what is it exactly, what benefits does it hold for us and last, but not least, what does it mean we eat?? Mediterranean cooking is a simple cuisine; one whose basic tenet is that food should be served as close to its natural state as possible. Greek Olive Oil is one of the Mediterranean diet staples and it’s used in everyday dishes ranging from appetizers to dinner to dessert! Read more…. 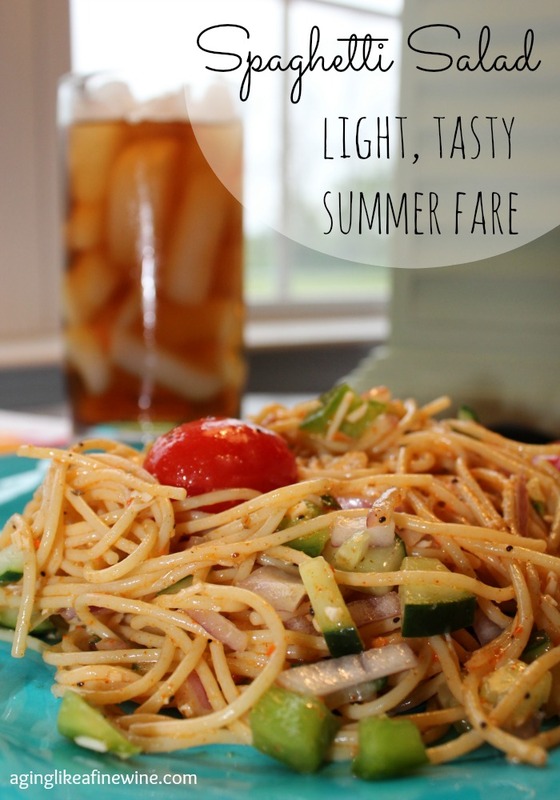 Spaghetti Salad….light, tasty fare for warm summer months! How is the weather in your corner of the world? Here in the East we have had a rainy spring! I appreciate the rain, I know we need it, but enough now!!! I need some sun! And today I’m looking at, wait for it…. sunshine! Sunshine and warm weather bring about a more active lifestyle and make me want to eat lighter meals. I started digging through my old recipe binder and found a Spaghetti Salad recipe that I can’t even remember the last time I made. I know that I received the recipe when we lived in California and that was 20 years ago! Anyway, I wanted to give it a try again, so off I went to get Read more….